The fourth installment of the Fisher Investments On series is a comprehensive guide to understanding and analyzing investment opportunities within the global Industrials sector. 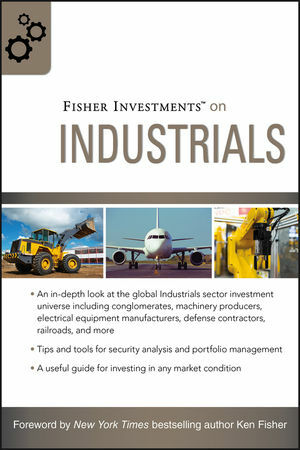 Fisher Investments on Industrials can help you quickly become familiar with this highly diversified sector, how the sector is segmented by industries, their respective macroeconomic drivers, and the challenges facing Industrials firms. This reliable guide skillfully addresses how to determine optimal times to invest in Industrials stocks, and which industries and sub-industries have the potential to perform well in various environments. The global Industrials sector is complex, including a variety of sub-industries and countries—each with their own unique characteristics. Using the framework found here, you'll discover how to identify these differences, spot opportunities, and avoid major pitfalls. led with in-depth insights and expert advice, Fisher Investments on Industrials provides a framework for understanding this sector and can help you make better investment decisions—now and in the future. With this book as your guide, you can quickly gain a global perspective of investing with regard to Industrials. MATT SCHRADER is an Industrials analyst for Fisher Investments. He is also a contributing columnist for MarketMinder.com. Matt is a graduate of the University of California, San Diego. Originally from Marin County, California, he currently resides in San Francisco. ANDREW S. TEUFEL has been with Fisher Investments since 1995 where he currently serves as a Co-President and the Director of Research. Prior to joining Fisher Investments, he worked at Bear Stearns as a corporate finance analyst in its Global Technology Group. Andrew also instructs at many seminars and educational workshops throughout the United States and United Kingdom, and lectures at the Haas School of Business at UC Berkeley. He is also the Editor in Chief of MarketMinder.com. Andrew is a graduate of UC Berkeley.